Seemingly, people in the space community have a tendency to push the boundaries of thought about all the possibilities that await us in the universe. Case in point: Geoffrey Landis. Landis is a scientist at NASA’s Glenn Research Center who writes science fiction in his spare time. Last week Landis shared with us his ideas for using a solar powered airplane to study Venus. This week, Landis goes a step farther (actually, several steps farther) with his ideas about colonizing Venus. Yes, Venus, our hot, greenhouse-effect-gone-mad neighboring planet with a crushing surface pressure that has doomed the few spacecraft that have attempted to reach the planet’s mysterious landscape. Landis knows Venus’ surface itself is pretty much out of the question for human habitation. But up about 50 kilometers above the surface, Landis says the atmosphere of Venus is the most Earth-like environment, other than Earth itself, in the solar system. What Landis proposes is creating floating cities on Venus where people could live and work, as well as study the planet below. 50 km above the surface, Venus has air pressure of approximately 1 bar and temperatures in the 0Â°C-50Â°C range, a quite comfortable environment for humans. Humans wouldn’t require pressurized suits when outside, but it wouldn’t quite be a shirtsleeves environment. We’d need air to breathe and protection from the sulfuric acid in the atmosphere. So, create a bubble, fill it with Earth-like atmosphere, and it would float on Venus. “If you could just take the room you’re sitting in and replace the walls with something thinner, the room would float on Venus,” said Landis. The biggest challenge would be using a substance resistant to sulfuric acid to form the outer layer of the bubble; ceramics or metal sulfates could possibly serve in this role, but of course, you’d want to be able to see outside, as well. “Just think of the great pictures you could get,” said Landis. Anyone having visions of Bespin and Lando Calrissian from “The Empire Strikes Back”? Maybe that should be “Landis” Calrissian. More information about Geoffrey Landis. I was thinking the same thing if you fall your done..
What if we created a deathstar like planet (w/out the wmd’s) created entirely out of some kind of metal and just place it in orbit w/ the moon and earth. It would still be in the habitable zone and we would’nt be that far from home. I highly doubt Venus will be the first planet we colonize. If it is ever colonized it will be because there is a demand for some mineral, ore, metal, or gas which might be found abundant on or in the surface. Only then would it make sense to build such an incredibly complicated habitat that is comfortable enough for human life. Of course the bots and flying sensors are well worth it and will increase in the future in their atmosphere. It would be a heck of a drop if you fall over the railing. And couldn’t we just purchase enough carbon credits to thin out that atmosphere? Possible or not, I can’t think of a single compelling reason to do it. At least not on the scale of a city. I would like to see some sort of technology developed that would allow us to send floating unmanned research stations into the atmospheres of the outer planets. That way we could monitor conditions for days/weeks/months/years instead of having to deduce as much as we can about their weather from one flyby. Crazy, of course. But all good ideas are at first. It’d be nifty if we could find some way of effectively desulphurising SO_2_/SO_3_/H_2_SO_4_ to get a local source of oxygen. Many reasons to do it. Tourism, science, resource extraction, exploration, human spirit. I could go on. Who WOULDN”T want to go to Venus? That is where all the women are! This idea is just flaming bonkers. If they do this crazy project before they get around to me getting my own flying car I am really going to upset. If they did do this project the goofs who existed there would still be subject to the sun blowing up. I thought space exploration was all about hiding from the sun and rouge asteroids. Perhaps this floating city should be floated over the toilet for a moment and then flushed. -Space exploration will probably be really beneficial to humans once we do start colonizing places or getting resources from other locations etcetc; however, for now we’re just learning about the final frontier. All these probes we’re sending out aren’t preparing the planets for us, they’re simply gathering information about our solar system. And that’s a very important step. We don’t really have any goal like ‘save us from the sun!’ or anything. Plus, the sun has like 6.5 billion years before it takes out the solar system. If humans are still around in 6.5 billion years, I assume we’ll have colonized the greater portion of the universe, and the loss of this solar system won’t be so bad. Think of how much we’ve done in just the past couple thousand years! We’ve gone from caves to space stations. I think this city be a great idea. Like someone said, it could be a tourist attraction and generate revenue, as well as the absolute best way to learn all about Venus. I’m for any project that teaches us about our solar system! Again, that’s really our real goal right now. Of course, like Mr. Landis said, though, this is just food for thought. It won’t happen for awhile, and neither will any other space colony. We must remember we’re still having trouble sending robots to Mars, and sending humans on a short trip to the moon is still 10 years off. This would be an engineering project orders of magnitude beyond anything we’ve attempted, and the cost would be unrealistic to put it kindly. Yeah. before this is done, they (whoever ‘they’ are) should make it possible for me to have my own personal computer too, and…oh, wait. Why build the cities floating in the atmosphere? too dangerous if things go wrong. Put the city in orbit and send down craft to sightsee and study. Or if you’re hellbent on being in Venus’s atmosphere, build a huge tower a hundred miles tall and lower it to the surface, then put the city on it. Sounds like something Greg Egan would dream up! As the man said – it’s just a thought exercise. The energy required just to get the space station into L.E.O has been mind-boggling enough, and that’s just a piddling little thing! I’m really tickled that someone else has finally thought of this! When considering other places to live in the universe, Venus has one advantage that Mars does not. Its gravitational acceleration is almost the same as Earth’s. One of the things that have not been addressed in all the planetary colonization schemes (as far as I know) is what will the affect of living and procreating in a gravity environment that has significantly less acceleration than Earth’s have on us? Can a child develop properly in an environment where the gravitational acceleration is less than Earth’s? If so what is the minimum gravitational acceleration that will allow this to happen? There needs to be a lot more research into the effects of low acceleration environments on the human body and its development, before we can confidently consider colonizing any world that is significantly smaller than Earth. This is one of the reasons that I would tend to agree with Gerard O’Neill that our off-Earth colonies should be rotating in free space where we can control the acceleration environment as apposed to planetary surfaces. I expect that someday there might be a reason to build a floating city on Venus in a hundred or two hundred years, but in the nearer term I can see research stations similar to Antardtic research stations being established, maybe in the second half of this century. The real trick will be the surface material that will resist the corrosive effects of sulfuric acid. I also thought of a ceramic ballon similar to the Japanese fishing floats, but much bigger with thin walls. I would have used hydrogen as the lifting gas since in a carbon dioxide atmosphere the hydrogen would not be explosive. However the use of a nitrogen oxygen atmosphere, though less boyant, is very elegant. Like I said I’m tikled with this idea. Takes me back to James Blish ‘Cities in Flight’ books. The russians proposed exactly the same idea of floating cities high in the Venus atmosphere, long time ago, some 30 years ago. Venus will not be easy to build a city on, but it is a good target for terraformation (and thinking about how to control its temperature is a good thought exercise for dealing with long term climate swings on earth). Floating cities on Jupiter/Saturn were part of a story by Azimov. Fuller proposed an geodesic floating city on Earth. Nasty triple threat atmosphere on Venus. Years ago as an undergrad I very briefly looked at what it would take to operate on the surface of Venus. Atmospheric diving suits can operate near the 90 atmospheres. An engineering friend thought that they might eventually even be able to beat the acid problem. But the heat would pretty effectively stop anything person sized. Why bother to put it on Venus? If you could build something like that, we’d probably need it here on Earth at the rate we’re going. Soon Venus really will be our sister planet if we don’t get moving on Climate Change. Then again, that’s what I think is areally good benefit of the space program–it’s cranking out tools for living in a hostile environment. So go ahead and plan it for Venus and then we can have it here on Earth ready to go in case a catastrophe requires it. Larry Niven’s Ringworld made a remark that I guess in retrospect should have been obvious to me–that a huge byproduct of human civilization is planetary heat. So while I used to think we should seek warm planets to live on, now that I see how easy it is to heat them and how hard it is to cool them, I’m more bullish these days on colder worlds than I used to be. Looks like a great place for a penal colony! For executions we could just toss ’em over the railing and send ’em straight to Hell. I’d be more inclined to try out the physics of tethering it to a space elevator – this would provide access to orbit AND the surface. Actually, the sun will destroy Earth in about 1 billion years, in terms evaporating the Earth’s atmospheres and oceans. No more worries about solar flares, meteorites, sudden decompression and roasting/freezing to death. It would be a base from which to work down to the surface. I’m thinking you would use some form of foam as the floating platform. Seal it and the air inside adds lift too. If cities can float there, surely some CO2 eating bacteria and sulfur eating microbes could too? As long as enough of them stay afloat, they could slowly eat the sulfur and Carbon in CO2 and take it with them when they fall down, clearing up the upper skies and providing oxygen too. if things went extremely pear shaped. Coat the floating cities in a thick layer of known bacteria from earth that eat sulfuric acid, its nutritious for them! these could also with a genetic tweak or two perform photosynthesis and exhange the c02 of venus for oxygen. these are bacteria found in hot springs and ocean vents. bacteria could terraform venus in a few hundred years only. and the upper clouds of venus are loaded with acidic water vapor….perfect for extremophile bacteria? Actually, we seem to have a solution available at hand. the question is, can we implement it? I wonder if, someday in the future, we use technology to siphon off excess gasses from Venus, transport them to Mars and release them into Mars’ atmosphere. thus thickening the Mars atmosphere and adding a bit of needed Sulfuric Acid for chemical reactions and eventual life creation. This also has the nice benefit of thinning out the Venus atmosphere, and perhaps making it a bit safer to terraform. We will still have to find a way to solve the “Mars has no molten core” problem, but I figure once we are advance enough to transport large amounts of atmosphere from one planet to another, heating a planet’s core shouldn’t be too much of an issue. Of course, this is all FAR distant in the future, but we WILL need more room to expand. I don’t see why we wouldn’t try it if we had to. Let’s just face it — the Jetsons are our destiny. Has anyone thought about the magnetic field? Only Earth of the small inner planets has it! If You are going to live on Mars/Venus/Moon etc then you must think of a way to protect humans from cosmic rays which basically is gamma radiation. Even though there are machines that can replicate the magnetic field created by Earth they dont seem to be able to protect the whole planet. Speaking of Jupiter and Saturn – they are emitting large amounts of radiation so no floating cities on them! It even got that far that NASA was worried about the electronics of space probes being seriously affected. the easiest way to terraform Mars is to use robot space craft to ‘nudge’ large comets so that they collde with Mars– possibly using nuclear blasts to alter the cometary orbits. this would create a water and oxygen loaded atmosphere almost instantly. it might also restart the stalled geology of Mars, heating up its cold center, causing fresh volanic activity which would further thicken and warm the atmosphere. a few hundred years of this, with bacterial bio-remediation, and Mars could be very habitable. I could imagine little robot balloons in the upper atmosphere, maybe with plant/bacteria colonies or similar artificial machines to terraform the atmosphere, but that’s about it. Just think about the wind in the upper atmosphere, considering the slow rate of revolution of the planet – only one side is heated, due to that, unlike earth. On the ground, the thick atmosphere evens out much of the difference, but not in the upper atmosphere. As any inhabitants exposed to sunlight will need to cover up anyways, it shouldn’t be too much extra effort to create tubes with lower pressure and temperature control on the surface. The solar radiation makes a great source of energy for plants, solar power, and the likes, thus the excess heat is probably easy to get rid of, if the planet is clouded with satellites for different purposes which use up solar energy and radiate heat directly into space. Besides, a billion years is enough for a few million generations of humans using the planet until the sun expands – which is early enough to think about leaving. Not to mention that a red giant is apparently a sun going through slightly more extreme solar eruptions, shedding large parts of the surface, and posing not much more than a hot hydrogen cloud for a planet within such bursts. bacteria could spread through the upper atmosphere of venus on their own, i don’t think it would require balloons. If we’re talking about genetically tweaked bacteria, why would they have to be small? Why not engineer them to be really really big and productive? That way the time it takes to terraform could be substantially reduced? And while we’re on the topic of engineering, why even use organics when we could design/build artificial life forms using nanotechnology to withstand all the hazards. This way we can simply shut them all down when they’re done. for one, drexler type nanotech doesn’t even exist. and it may never. and also, the small size of bacteria is one of their chief advantages. they can multiply their numbers exponentially. if nanotech can even work outside of static thin film applications,, and this is dubious, its centuries away. bacteria are life, and life does already function with real nanoscale components ie proteins, enzymes, etc. ha! Now all we need is transparent aluminium. wtf is going on at mimas? Can’t use aluminum… it would corrode! Industrial acid handling equipment choices are typically polypropelyne plastic, glass, enamel coated iron. For a floating city, the best choice would then be plastic with a few small glass windows. I suspect the glass may get etched over time and have to be replaced. Blow-molding “large” sections could then be snap-fit together and pressurized with air to be the floating balloon city. Then tether with (multi-layer coated) stainless steel cables to an even larger cable between big rocks on the ground and a big rock in low synchronized orbit above. Then continuous-elevator with that cable from ground to the balloon city and space all the rich industrial acids and other chemical byproducts to transport by solar sail to Mars, Earth, and back in a triangular trade pattern. The tricky part is getting the cable strong enough and light enough to work – as the US space elevator program has found. The rest is “easy”. I wouldn’t be so pessimistic if I were you. Nanotech has come a long way in a short time and in the least the most primitive type of derivative innovations which would be needed to accomplish terraforming will likely be developed in the short term (probably 2015 to 2020). On the nanotech side, microbial artificial life has already been created in labs. Advancing and engineering that artificial life to terraform is not as far off as you might think. On the natural side, reprogrammed bacteria is already in use making such things as biofuels. Reprogramming bacteria to terraform either in large number or substantially larger form is also very possible in the short term. Who knows maybe these critters can be engineered to act as safety nets for unfortunate falling Venusians. Soo.. if floating oxygen and nitrogen bubbles is a practical idea, why send a plane? Why why not send a floating surveyor? (1) This definitely is not a new idea. At least a half dozen writers have spoken of similar things. While I am by no means a famous writer, I wrote about this exact same thing in various internet forums over a decade ago. (2) Eventually, it may be economical to extract rare resources from Venus, presuming they can be found nowhere else more cheaply. But that question is far from settled. (3) It seems that a unmanned operation, at most, would be far more practical on just about every level, barring very unusual discoveries on Venus into the foreseeable future. That’s right, because the whole world revolves around you and your empty-headed consumer-driven “needs”, right? Why bother to do anythig truly spectacular if you can’t get a flying car out of it? Let’s stop all progress and imagination and dreams of something bigger until DAVE bloomin’ S gets his precious flying car. And people wonder why I want to see the human race wiped out..
I’d love to terraform Venus.. and then populate it with a race of heavily-armed robots with orders to shoot humans on sight. That would be awesome. I’d leave your flying car there for you to go pick it up. Hmmm. Could also build a new sat and put it up there. This might be an interesting way to put sats up there in general. That would allow much better pix and better understanding of venus. I’ve already given this topic some thought (and it’s not new, as others have mentioned). I think Buckminster Fuller’s Cloud 9 concept would be perfect for this. It would certainly be easier than an O’Neil cylinder in the asteroid belt. Use in situ resources to build a geodesic sphere with a diameter measured in kilometers. The struts and suspension cables should probably be CNT’s for their strength/weight properties. Filled with Earth’s atmosphere it will float easily. People live on the inside of the sphere. With a wide vista and artificial day and and night cycles there is no need for windows. The outer shell would be photovoltaic, with a regenerative glass or similarly transparent sulfur shield. Venus gets more intense sunlight than Earth; there would be no shortage of power. Link 3 or more of these spheres together in triangle formations for stability so that wind or minor mass movements within the sphere won’t make them roll. Why go? Because I feel like it. Join me if you want, stay on Earth if you prefer. Doesn’t matter to me. With all the talk of inflatable space stations now a days it doesnt seem like that far of a strech to turn inflatable space stations to venus blimp cities. Because the atmosphere has raw materials for construction and building breathable atmosphere, and because the planet provides gravity that you’d otherwise need a large rotating habitat or tether-and-counterweight system to achieve, and a human-friendly temperature range that removes the need for complex thermal control systems. Venus is effectively the only other source of nitrogen in the inner system aside from Earth itself, and although Venus is very dry, the atmosphere does contain water, and sulfuric acid which can be converted into water or itself used in industrial processes. And the atmosphere is primarily CO2, which can provide carbon for polymers. Once bootstrapped, small supplemental shipments of minerals and machinery would allow enormous expansion, the atmosphere itself providing building material and lifting gas. The Venusian habitats could provide atmospheric gases and polymer building materials to the inner system. In reality, it is probably one of the easiest places to establish large Earthlike habitats. The plentiful sunlight, ease of constructing large habitats under Earthlike gravity, and constant supply of CO2, nitrogen, and water from the atmosphere could make it an agricultural center for supplying the inner system as well…not only with food, but also chemicals and materials derived from plants. And yes, the rocket fuel for getting things into orbit could also be synthesized from the atmosphere, and the thick atmosphere makes Venus itself one of the easiest planets to land on (even if you never actually touch land). The enzyme in question has problems with exposure to oxygen…but oxygen is rather lacking in the atmosphere of Venus. The tower/beanstalk concept is entirely unworkable on Venus. It’s barely doable on Earth, and Venus simply doesn’t rotate fast enough (243 days per rotation) to hold an elevator or tower up. However, this has its benefits…sunrise to sunrise is about 117 days, and it would be quite feasible for a habitat to circle the globe (perhaps powered by solar-thermal jet engines) in that time, staying in continuous sunlight. The greater intensity of sunlight and the lack of a night period would make solar power far more effective. Firstly, Landis acknowledges earlier writers in his original paper – he merely updates the concept somewhat. Secondly, the winds on Venus at roughly the level suitable for a colony go around the planet in roughly 4 days, so the effective day is much shorter than the 117 earth-day solar ‘day’. Industrialising Venus would motivate investment in floating facilities there. The main product would be either nanotubes or stabilised carbonia – so much more carbon in Venus’s atmosphere than the whole asteroid Belt, and a lot of nitrogen too. The planet is very, very dry however – the acid clouds don’t amount to very much hydrogen or water at all. GREAT idea for a robotic research station. Maybe workable for people, too, but still not safe enough to live there for anything but research. Attach a big oxygen-nitrogen bad to yourself (the more N2 the better; it’s a little lighter than O2), and as long as you don’t puncture your O2 (which would do you in anyway), you don’t fall. 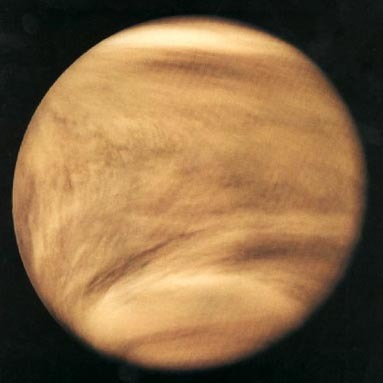 The original problem with Venus: because it was a little too hot originally, it had no water trap in the atmosphere, so it lost the hydrogen in its water due to photo-dissociation in the upper atmosphere. So it now has an excess of oxygen, which led to the CO2 smothering blanket in the air. If we could find a reaction to combine the H2SO4, and fire off the oxygen (and hydrogen, necessarily) into space straight from the upper atmosphere as this is done, then conditions could get a lot more reasonable. The big trouble: Venus does not ROTATE very much, and one side always faces the Sun, and there’s too much sunlight anyway. So you’d have a hard time holding onto any water. That’s the big deal-breaker for anything but the most drastic terraforming approaches. Sinistro: the thick, radiation and micrometeorite-blocking and temperature-regulating atmosphere would make Venus one of the safest places in the solar system for habitats. What are you hiding on the night side for? There’s no magnetic field, but there’s a thick blanket of atmosphere to block x-rays, gamma, and charged particle radiation from the sun. There is no ozone layer, but UV is trivial to block. Terraforming is a waste of time and effort. It would require an enormous investment of resources and would require constant maintenance. The atmosphere of Venus is a resource, not an obstacle. Adam: the winds are extremely variable in latitude and altitude. The velocity you gave was for the cloudtop winds in the middle latitudes. At the altitude a habitat is likely to occupy, windspeed is less than half that. At other latitudes, it will be even lower. However, if heading upwind to stay in sunlight is impractical, it is still very possible to cast a drag anchor into the slow-moving lower atmosphere to stay in the sunlight longer, and move into the upper atmosphere to minimize the time spent on the night side. Venus *is* very dry, but there’s enough hydrogen to make enough H2SO4 and H20 to blanket the entire planet in an unbroken layer of clouds. Water is still the fifth most abundant substance in the atmosphere, and will concentrate in the H2SO4 clouds due to the extremely hydrophilic nature of sulfuric acid. There’s not enough left to make any major bodies of water on the surface if the planet were cooled down, but there’s plenty left to harvest for industry and habitats. Folks, just crash an ice comet or two into Venus’ atmosphere. That’ll solve all your H2O needs. A terrible waste of volatile ices, a hazard to habitats and probes already in the atmosphere, and a disruption to observations of the atmosphere. The water from a single comet, spread diffusely across the planet, won’t increase the atmospheric concentration of water enough to help. If you can grab a comet, you’re better off protecting it with sunshades and mining it for ice to be delivered directly to the habitats. Same goes for terraforming Mars, by the way. You can bombard the poles with comets or nukes and spend centuries building up oxygen, and you get a planet with a thin, cold atmosphere which will require continued maintenance. Or you can build domes that get you more Earthlike environments than terraforming could ever create, and do so from the beginning, and mine the polar ices and comets/asteroids. Really, due to the low gravity, weather, and reduced sunlight, you’re better off with orbital habitats where you can achieve Earthlike spin gravity and use mirrors to concentrate sunlight. The advantages of Venus are Earthlike gravity for small, non-rotating habitats, an environment with Earthlike temperatures and pressures and protection from radiation and micrometeorites reducing structural mass and the consequences of a breach (seal the compromised area off, then put on hazmat suits and patch the breach), plentiful availability of nitrogen (which Mars or orbital habitats would need a constant supply of), and sunlight for crops without concentrator mirrors. An intriguing idea even if it’s presently an impractical one. Still, with fledgling companies like JP Aerospace, who are working on just such a project for the Earth’s upper atmosphere, the basic R+D might very well be in place by the time it comes to seriously explore such a concept for other planets. And with Venus being closer (meaning less delta V required to reach) than Jupiter, Saturn, etc., it would be the logical target for such. My best guess is that they don’t actually mean *orbit* in the sense of being high enough and fast enough to circle the globe without power, and will eventually reveal that they’re marketing powered upper atmosphere airships as substitutes for orbital satellites. That kind of dishonesty leads me to look elsewhere regardless of the other differences…Bigelow Aerospace would be a good bet. They’ve got experimental habitats in orbit, and have been doing well at proving out the technology. A version for operating in the Venusian atmosphere would have thinner walls, lacking the need to hold in the same internal pressure and protect from micrometeorites, simplified thermal control systems due to the more moderate environment, and possibly coatings to resist the sulfuric acid in the upper atmosphere of Venus. That latter is not actually particularly hard to accomplish, the current materials (largely Vectran, apparently) might already be sufficient. The sulfuric acid will no doubt be the basis of the cloud cities’ economy and life support systems. I mean, what’s the number one industrial chemical in the world? Sulfuric acid. It’s needed to make just about everything it seems. Energy? No problem. Solar, or simply using heat siphoned from below. I have an idea for cooling Venus. Build a bunch of balloons, each with it’s own freezer that would siphon in carbon dioxide and freeze it into huge blocks of dry ice. These blocks would be shot at high speed deep into the Venusian crust. Or instead of dry ice, these balloons could create diamonds and drop them onto the surface. A colony in Venus’ atmosphere has a much better safety than a colony on Mars. A punctue on Mars kills you. A puncture on Venus kills you, but with enough time for you to prevent it. JP Aerospace are using hybrid Chemical/Electric propulsion, not conventional Ion engines. Next PostNext How Old is the Solar System?